If I remember right, we had an unbelievably hot summer last year and utility bills were at their highest. This year has not been quite as warm, yet, but that doesn’t mean you can’t save some money on your utility bills this summer. Utility bills can be somewhat relative depending on where you live, but there are still some common things you can do to keep some money in your pocket as opposed to sending it to the utility company each month. Air conditioning is a fairly common luxury for most of us and one that I love to use. However, this does not mean that you need or should run it all the time as they only increase your utility bills. I was recently outside near my neighbor’s house on a 65 degree day and the air conditioning unit was running constantly. This is simply a waste. The outside air was plenty cool and they could have just opened the windows and saved themselves some money. With that being said, I know we all have our own comfort levels in relation to air conditioning. Just make sure you realize there is a balance to be had. If it’s going to be an unseasonably cool week then give your air conditioner a break. Your wallet will thank you. Programmable thermostats can cost as little as $20, or more if you want a fancy one, and they can pay for themselves in just a few short months. If your family is outside of the house during the day, then why are you cooling your house for nobody? It just doesn’t make any sense. Instead, program your thermostat to let the temperature rise in your house during the day and then begin cooling it off an hour before you get home. This is a simple way you can save money on utility bills this summer, not to mention during the winter. Instead of cranking your air conditioner when you get home from work, why not enjoy your porch or deck instead? This is assuming you have one of course. 🙂 The breeze and the shade will likely keep these areas cool enough to eat your meals and hang out. Open your windows once it begins to cool off and then enjoy your home for the rest of the night. No air conditioner needed. Heating up meals in your house will only make things hotter and cause your air conditioner to run more often. There are many other options outside of simply using the stove that can help relieve some of the stress on your utility bills. As opposed to warming up the stove, you can do things like preparing a salad from your garden to grilling. Not only will that cause your air conditioner to work less, but it can also open up more options if you’re trying to eat healthy. Many people water the grass in the middle of the day or early in the evening. While this does help the grass grow somewhat, it’s not the optimal time to give your lawn a drink. To save on water, turn your sprinklers on in the morning. The water will properly soak the roots and keep your lawn and plants nourished throughout the entire day. By watering early, you won’t have to expend as much H2O, and your grass will look more green and luscious. This might sound like a strange one, but I have heard of many people relocating their bedroom when summer time rolls around. If your bedroom is upstairs where it is hottest, instead of blasting the air conditioning to bring the temperature down, consider picking up your mattress and moving it to the basement for a few weeks (during those really hot stretches). You will be more comfortable and will save a bunch of money on your utility bills. 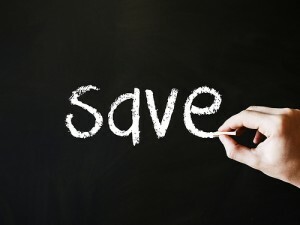 What are you doing to save money on utility bills this summer? Is there a certain temperature that you avoid going outside in? Have you ever moved your bedroom temporarily to save money? Ha ha, sounds good. 🙂 We’ve not been as hot either this year. It has been in the low 70’s here all week when it’s normally near 100. I’ll take the cooler weather! Almost every room in our new house has a ceiling fan and it helps a lot! We just keep them going until it gets so hot we have to turn the air on. We have a few ceiling fans as well and love using them. They can be a great way to avoid turning on the AC when weather permits. Having a basement can really help things. It always seem to be anywhere from 5-10 degrees cooler in ours. We live in an apartment and there is no cross ventilation…so even when it isn’t too hot outside at night, it is still very stuffy inside. I can try one of those dual fans that is supposed to pull out the hot air and bring in the cooler air. We also go out on the balcony where it’s a lot cooler. We have very poor cross ventilation as well which does make it feel even stuffier. It also doesn’t help that our two year old sees the screen door open and want to run through it either. I think the programmable thermostat is the best way to save. I love ours and it has saved us good money. Our new house is older, but it stays very cool in the rooms throughout the day due how the sun travels overhead. I agree, a programmable thermostat is definitely the way to go. Great tips, John! Saving money on your electric bill is easy when you know where to make cuts. A high electric bill can be a source of great stress for many struggling consumers like me. Thanks Alicia! I agree, they can be stressful. We’re on a level payment plan ourselves so we know what we’ll be paying each month without some sort of surprise. I know, we like to do that as well! We don’t get the best in terms of cross ventilation, but we love to do it anyway.